With Lean tools and processes at your command, you're well on your way to gobbling waste from your supply chain operations. Wakka wakka! Imagine a supply chain working in absolute harmony, with the perfect amount of raw materials arriving on the factory floor just in time to make the exact number of products needed to meet customer demand. Finished materials are then swiftly transported to their final destinations without wasted time spent idling along the way. Engaged employees oversee the entire process, eyes peeled for inefficiencies needing to be addressed, because continuous improvement—as opposed to one-time process changes—is integral to Lean success. If workers spot any waste, they chase it down and obliterate it. This ideal scenario may be difficult to achieve, but companies operating by Lean principles work toward it daily. Lean's roots lie in manufacturing, with Toyota pioneering the idea in the 1950s. The philosophy has spread into supply chain management, transforming companies along the way. The changes often result in smaller batch sizes, more communication internally and with suppliers, and increased adaptability to market conditions. To remember the seven wastes of Lean, which are at the root of all unprofitable activity within your organization, use the acronym DOTWIMP. In a company's daily work, routines that maintain organization and orderliness are essential to a smooth and efficient activity flow. 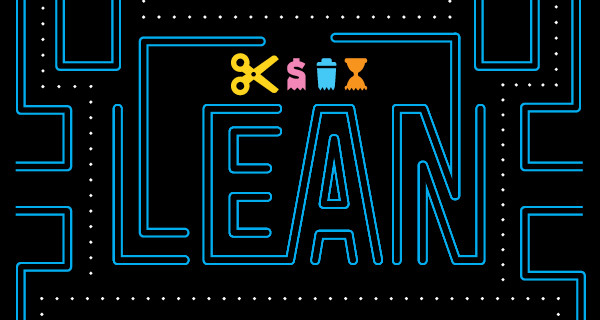 The 5S Lean method encourages workers to improve working conditions, and helps them learn to reduce waste, unplanned downtime, and in-process inventory. A typical 5S implementation significantly reduces the square footage of space needed for existing operations. It also organizes tools and materials into labeled and color-coded storage locations, as well as "kits" that contain just what is needed to perform a task. 5S provides the foundation on which other Lean methods can be introduced. Sort: Remove all items not needed for the current production operation. Straighten: Arrange items so they are accessible and clearly labeled. Shine: Clean and tidy the work area. Standardize: Define the normal condition of the workspace. Sustain: Ensure the improvements are continually carried out.